Tap: Target creature gets +0/+4 until end of turn. Vlasiax on [PRIMER]Don't Touch China!!! Well, I think that Armadillo Cloak isn't that necessary as Arcades' deck is very defensive and doesn't need lifelink. 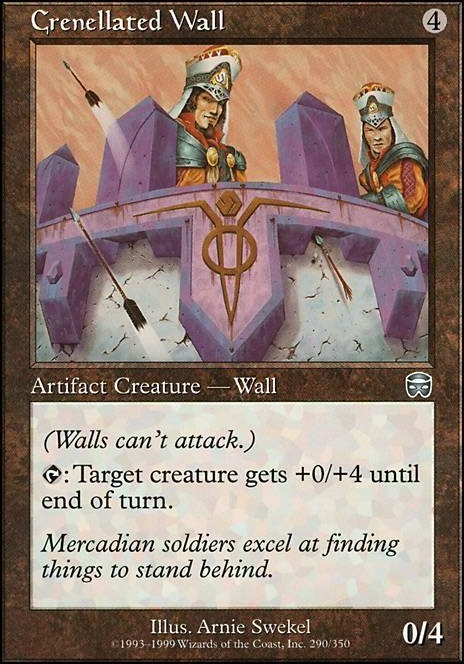 Same thing with Crenellated Wall - for +0/+4 boost from artifact without immediate impact on the board besides drawing card with Arcades? For me it would be better to add classic Tower Defense just because it affects every defender and can be used as combat trick so with 2 walls connecting with opponent you net 10 extra damage for . Also I prefer using cards that blink or counter boardwipes (besides Heroic Intervention - saved me so many times <3) because hexproof won't save everything you have when someone casts boardwipe. And THAT'S the moment when sac outlets really shine because when someone tries to screw you big time you just gain resources from sacrificed permaments (which would die anyway) to rebuild ASAP. But that's just meta call if your meta tries to squeeze Swords to Plowshares , Path to Exile , Reality Shift , etc. in every deck humanly possible then I understand. However, in this case they can be used when you run out of counter/hexproof cards so you break even from losing card on board. 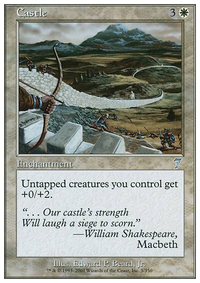 Generic good cards: Path to Exile and/or Swords to Plowshares are standard white removal spells. Both are cheap (mana and $ wise) and instant speed, use at least one. Asceticism grants regeneration and hexproof, Krosan Grip for artifact/enchantment removal, or go with Acidic Slime/Bane of Progress. Scavenging Ooze is also good against graveyard shenanigans. 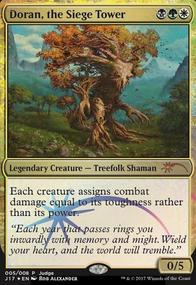 Cyclonic Rift is a must if you are playing blue, and a few cantrips and counterspells are useful too. Thank you joecool1299 for your opinions and suggestions in regards to our collection. I will try to explain and answer your concerns to the best of my ability. Dragon Throne of Tarkir I personally have no excuse for this as to why it was not included. Must have been overlooked. The best Wall CEO must have the best chair to sit on. Crenellated Wall We had this during our first wave stock but surprised as well not to see it. Will take care of that as soon as possible. Does not need additional tempering and improves wall efficiency. Shield Sphere We were not informed the existence of such wall. Some of our employees are new so it is possible that it was not known to them. Wall of Nets I agree this is mandatory for the various annoyances that run rampant along our aisles. Panharmonicon Though it is true that this will push value further, we do feel that it may not be as consistent as we think. But will see to its use after we run more tests. Rolling Stones It may be redundant but there are times our CEO may not be around and away for his business meetings so it is a way to continue wall production. Shield of the Oversoul This is mainly used as an ego boost as he is frequently bullied by his cousins and siblings. After therapy we can consider its recall. All these will be addressed during this meeting and changes may bee implemented within a day or two after the meeting has concluded. One again, thank you. I very much enjoyed my stay at the Arcades' Walls and Wares Emporium. Of all the new wall establishment that have been popping up recently, yours has the best selection of walls and accessories I've seen. That said, I was very disappointed to not find a Dragon Throne of Tarkir. Not only is it hilarious, it gives Arcades a power boost and works well with your vigilance effects. Crenellated Wall is also something I was surprised not to see. Most Emporiums have them front and center. I also would look to acquiring a Shield Sphere for obvious reason. And a Wall of Nets for the kids. And all good establishments will have a Panharmonicon for extra value. I also question the need of the Rolling Stones. They seem redundant with Arcades and they scared Mr poofypants. I also believe that Shield of the Oversoul is far too gaudy and doesn't quite do enough for the disadvantage . I recommend sticking with a good pair of Lightning Greaves. That said I give this establishment 5 stars and will come again. I run a version that also uses the fatties without defender. See it here in case you want some inspiration. 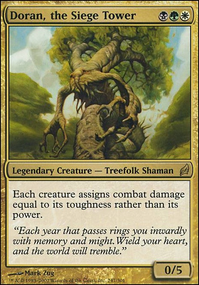 I like Doran as a casual Commander. Good old 'stomp em in the face' damage deck. People like to play against it here, cause there is no combo finishes. They see their end coming, eventually. 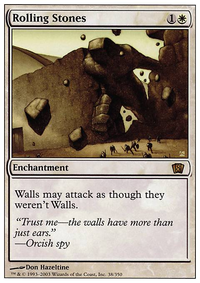 Belbe's Armor, Crenellated Wall, Solidarity, Brave the Sands, and Behind the Scenes are all really nice cards to put in a Doran deck. Slaughter the Strong is a nice new card to put in a deck like this one.